If you don't keep a weather eye out for these voracious little critters, you may wind up with brown, damaged, or even dead trees or shrubs. Learn how to recognize bagworms and eradicate them from your yard, before it's too late! Notice an inexplicable mass destruction, yellowing, or defoliation in your evergreens? A close and careful look through the branches might reveal the culprit in clever camouflage: bagworms. These destructive insects attack many species of tree or bush but are most often found on conifers like juniper, pine, arborvitae, cyprus, cedar, and spruce. They’re called “bagworms” because after the larvae feed on plants and trees, they encase themselves in cocoon-like “bags” constructed from twigs, leaves, and self-spun silk. 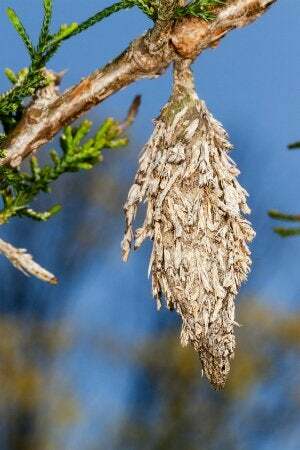 Once in its bag, a female bagworm can lay 500 to 1,000 eggs, escalating your bagworm problem to a serious infestation fast. 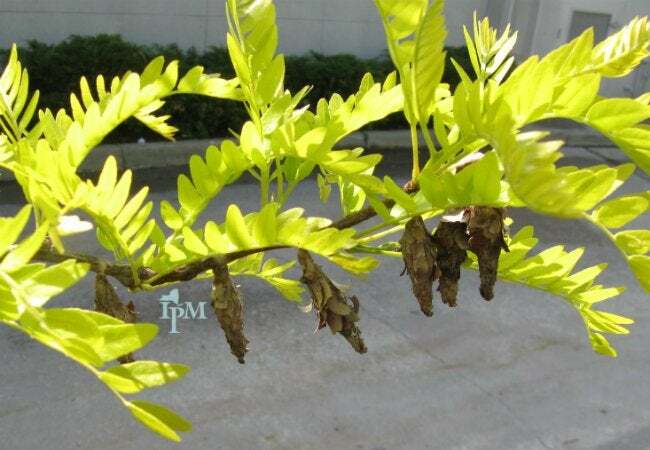 Each egg will hatch into another bagworm primed to defoliate whatever it’s near. The worst part? Your problem may go unnoticed until too late because these bags assume the appearance of conifer cones. Should you find yourself with a bad case of bagworms, follow this thorough guide to get rid of them. 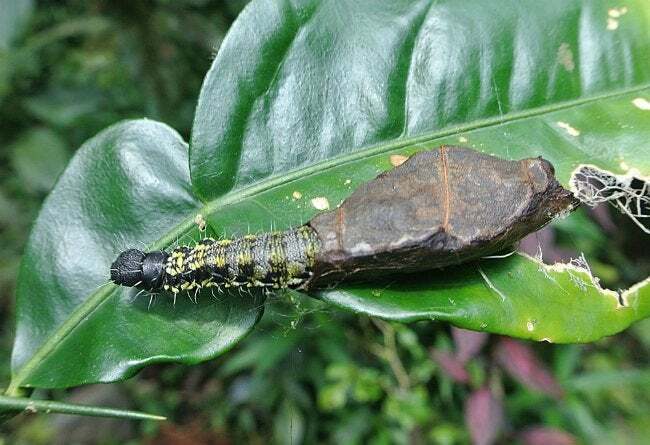 If you find just a few bagworms, you may have caught the infestation early enough that you can effectively control the situation by handpicking the bags off the plants and submerging them in a bucket of soapy water to suffocate the larvae. This will work, however, only if the larvae haven’t yet left the bags to go out to feed. Hatching generally happens in late May to early June, so do your handpicking of bagworms from late fall to early spring. Sometimes it’s not feasible to handpick bagworms, particularly when you’re dealing with tall trees. But if you can harness the power of creatures that feed on bagworms, you may still be able to control your bagworm population. Bacteria: Bt, the bacteria Bacillus thuringiensis, is effective at controlling bagworms if it’s applied as soon as the eggs hatch in the spring. Don’t wait too long—this bacteria won’t be as effective when the larvae have grown large. Follow the application instructions on the product you buy, and apply it with a garden sprayer. Follow up and reapply every 7 to 10 days until the bagworms are gone. Birds: Sparrows are predators of bagworms, so you may be able to keep the bagworm population down by attracting sparrows to your yard. To make your property more appealing for the birds, provide water at ground level (a low birdbath) as well as materials and places for nesting (thickets and trees). Sparrows also appreciate shelter to flit between, so brush piles and shrubbery can be assets, as can dusty areas for dust-bathing. An insecticide with malathion, diazinon, or carbaryl (such as Ortho Tree & Shrub Insect Killer, available on Amazon) can rid you of a bagworm problem if applied to bushes and trees when the worms are still young larvae. So, aim to spray in late spring, just after the bagworms have hatched and begun to feed, and always follow the insecticide manufacturer’s instructions. No matter where or what time of year you find bagworms, don’t wait to start formulating a plan to eradicate them. Left unchecked, they can completely defoliate and kill your yard’s trees, bushes, or hedges.